This is a 6 -8 second play. Guard passes to either trigger, and cuts through to corner. Post, after deep seal, establishes and presents. Then Post lifts to set on ball for the trigger man. 2 must 'Niggle' the defense, while waiting for the screen. Trailer has continued down the floor, split line, and curls off the weak side trigger screen at the block. 2 must now try to turn the corner on the drive or if unsuccessful, separate to the far quadrant of the key. 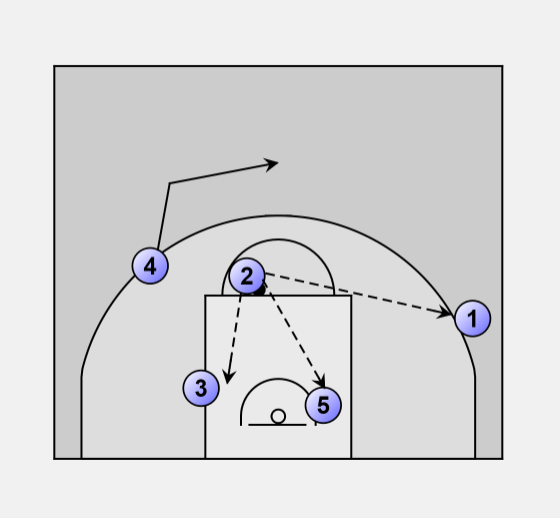 1 must 'lift' from the corner to replace (fill) the space vacated by the on ball. This is a strong shooting option for a 3pt shot, as the defense will adjust to the direction of the ball!! A. 2 gets both feet in the paint shoot and try to draw the help/Foul. B. 2 will have pass to trailer(4) on the curl. C. 2 will have the pass to the point who has 'Lifted' to the foul line extended, 3pt shot, with great rebound strength. 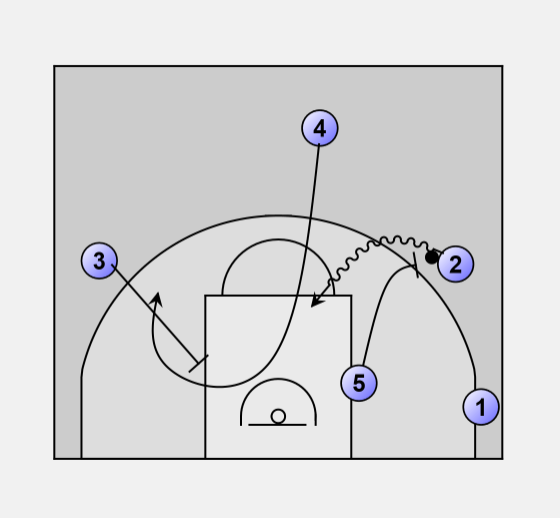 D. Both the 3 and 5 get to the basket sealing out on the way to establish rebound spaces. A. 2 looks to get to the far quadrant to improve angles for 5. She leads her to the basket with the pass. B. One's player will usually collapse to the post, so we are still able to hit the 1 man for a 3pt attempt. 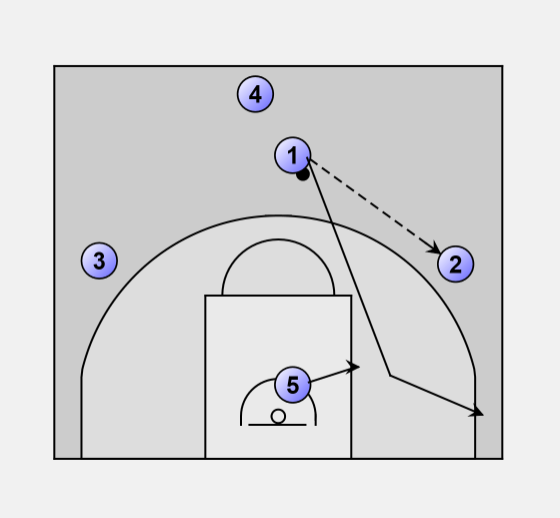 C. 3 is open on any help to the post, this can happen after a previously successful score from the post OR a strong pass fake at 5.